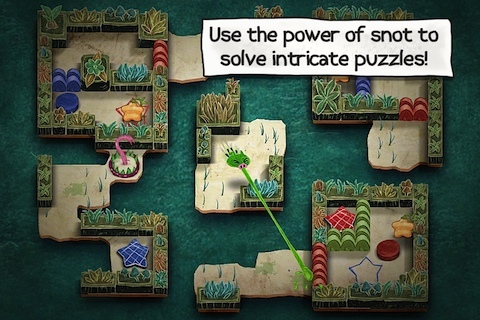 Gesundheit is a delightfully quirky adventure puzzle game for the iPhone and iPod touch, with a separately sold iPad version. Developed by Konami Digital Entertainment, the app is easy to get into and highly addictive. The object in Gesundheit is to help a snuffling pig work his way through a maze to find food and banish hungry monsters by luring them into traps with his snot. The little pig must also avoid being eaten by the monsters and falling into the traps himself. When he has finished the fruit and defeated the monster, he can move on to the next level. The game begins with two levels that are deceptively easy. The monster is separated from the pig and cannot cross the barriers, so the pig is safe from harm. In these levels, you learn how to guide the pig to the fruit and lure the monster into the trap. To control the pig, you simply tap the screen, and he moves to that point. You can control the monster’s movements by having the pig blow snot at a certain area. Then, the snot-loving monster will move to that point. If you can aim the snot into a trap, the monster will follow and meet his demise. You also learn how to break down walls by aiming snot at colored buttons to destroy the barriers. As you face these challenges, a little screen appears and guides you through the movements. When you get to the third level, the monster is able to move around, and you have to keep the pig from being devoured as he hunts for food. The monster can move fast, and you have to be able to guide the pig through the mazes and strategically aim the snot at the same time. If the monster eats the pig, you have to start over from the beginning of that level. This can be frustrating if you have already completed the other objectives, but it is also part of what makes it addicting. Each level has more challenges, and some levels have multiple monsters and challenges that are more complex. If you have trouble with one level, you have the option to skip to the next one. 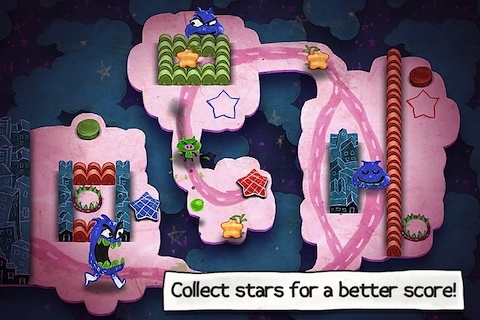 I’ve been playing Gesundheit on my iPhone 3G for this review and am really enjoying it. In fact, while writing this review, I found it difficult to stop playing the game. Graphics in this game are colorful and creative, while the characters resemble children’s drawings, adding to the appeal of the game. It almost makes you feel like you are part of a sophisticated fairy tale. The background music is quirky, light and fanciful and the controls are well designed. I would definitely recommend this game to other people who are looking for a challenging, light and addictive iPhone game. Gesundheit is well worth the 99 cents! AppSafari review of Gesundheit! was written by Darius Reimm on December 29th, 2011 and categorized under Adventure, App Store, Featured, Fun, Games, Kids, Puzzler. Page viewed 4613 times, 1 so far today. Need help on using these apps? Please read the Help Page.